The University of Pennsylvania (also known as Penn) is a private, coeducational research university located in Philadelphia, Pennsylvania. 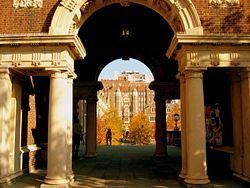 Penn is the fourth-oldest institution of higher education in the United States and the oldest university. 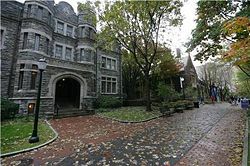 Penn is also a member of the Ivy League and is one of the Colonial Colleges. Benjamin Franklin, Penn's founder, advocated an educational program that focused as much on practical education for commerce and public service as on the classics and theology. Penn was one of the first academic institutions to follow a multidisciplinary model pioneered by several European universities, concentrating several "faculties" (theology, classics, medicine) into one institution. Penn is acknowledged as a leader in the arts and humanities, the social sciences, architecture, communications, and education. The university is one of 14 founding members of the Association of American Universities. Recognized as America's first university, Penn remains today a world-renowned center for the creation and dissemination of knowledge, about our world and ourselves as human beings for the benefit of all. In 1740, a group of Philadelphians joined together to erect a great preaching hall for the evangelist Rev. George Whitefield. 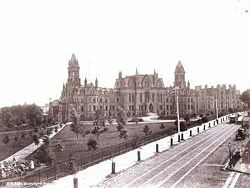 Designed and built by Edmund Woolley, it was the largest building in the city and it was also planned to serve as a charity school. The fundraising, however, fell short and although the building was erected, the plans for both a chapel and the charity school were suspended. In the fall of 1749, eager to create a college to educate future generations, Benjamin Franklin circulated a pamphlet titled "Proposals for the Education of Youth in Pennsylvania," his vision for what he called a "Publick Academy of Philadelphia." However, according to Franklin's autobiography, it was in 1743 when he first drew up a proposal for establishing the academy, "thinking the Rev. Richard Peters a fit person to superintend such an institution." Unlike the other three American Colonial colleges that existed at the time—Harvard, William and Mary, and Yale—Franklin's new school would not focus merely on education for the clergy. He advocated an innovative concept of higher education, one which would teach both the ornamental knowledge of the arts and the practical skills necessary for making a living and doing public service. The proposed program of study became the nation's first modern liberal arts curriculum. For more than two centuries, the University of Pennsylvania has been committed to excellence in scholarship, research and service. … Penn takes pride in being a place where students and faculty can pursue knowledge without boundaries, a place where theory and practice combine to produce a better understanding of our world and ourselves. The University was officially founded in 1755 by Benjamin Franklin. Franklin assembled a board of trustees from among the leading citizens of Philadelphia, the first such non-sectarian board in America. At the first meeting of the 24 members of the Board of Trustees (November 13, 1749) the issue of where to locate the school was a prime concern. Although a lot across Sixth Street from Independence Hall was offered without cost by James Logan, its owner, the Trustees realized that the building erected in 1740, which was still vacant, would be an even better site. On February 1, 1750 the new board took over the building and trusts of the old board. In 1751 the Academy, using the great hall at 4th and Arch Streets, took in its first students. A charity school also was opened in accordance with the intentions of the original "New Building" donors, although it lasted only a few years. For its date of founding, the University uses 1740, the date of "the creation of the earliest of the many educational trusts the University has taken upon itself" (the charity school mentioned above) during its existence. The institution was known as the College of Philadelphia from 1755 to 1779. In 1779, not trusting then-provost Rev. William Smith's loyalist tendencies, the revolutionary State Legislature created a University of the State of Pennsylvania. The result was a schism, with Rev. William Smith continuing to operate an attenuated version of the College of Philadelphia. In 1791 the legislature issued a new charter, merging the two institutions into the University of Pennsylvania with twelve men from each institution on the new board of trustees. These three schools were part of the same institution and were overseen by the same board of Trustees. Penn has two claims to being the first university in the United States, according to university archive director Mark Frazier Lloyd: founding the first medical school in America in 1765, makes it the first university de facto, while, by virtue of the 1779 charter, "no other American institution of higher learning was named University before Penn." 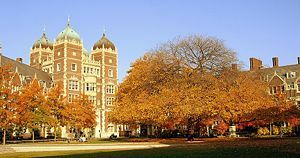 After being located in downtown Philadelphia for more than a century, the campus was moved across the Schuylkill River to property purchased from the Blockley Almshouse in West Philadelphia in 1872, where it has since remained in an area now known as University City. College Hall and Logan Hall viewed from Woodland Ave., ca. 1892. One United States president (William Henry Harrison); nine signers of the Declaration of Independence (Benjamin Franklin, James Wilson, Benjamin Rush, George Clymer, Robert Morris, George Ross, Francis Hopkinson, Thomas McKean, and William Paca); eleven signers of the Constitution (Benjamin Franklin, George Washington, James Wilson, Thomas Mifflin, George Clymer, Thomas Fitzsimons, Jared Ingersoll, Rufus King, Gouverneur Morris, Robert Morris, and Hugh Williamson); and three United States Supreme Court justices (William Brennan, Owen Roberts, and James Wilson) are associated with the University. 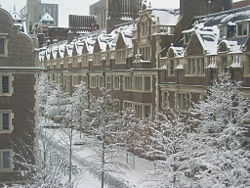 Penn's educational innovations include: the nation's first medical school in 1765; the first university teaching hospital in 1874; the Wharton School, the world's first collegiate school of business, in 1881; the first American student union building, Houston Hall, in 1896;; the country's second school of veterinary medicine; and the home of ENIAC, the world's first electronic, large-scale, general-purpose digital computer in 1946. Penn is also home to the oldest Psychology department in North America and where the American Medical Association was founded. Penn is one of the nation's few private universities to be named for the place in which it is located (others include Princeton University, University of Rochester, University of Southern California, Georgetown University, Boston College, Boston University, Syracuse University, University of Dayton, New York University, and the University of Chicago). Because of this, Penn is often confused with the Pennsylvania State University (also known as "Penn State"), a public research university whose main campus is located in the geographic center of Pennsylvania in State College. Much of Penn's architecture was designed by Cope & Stewardson. The two architects combined the Gothic architecture of the University of Oxford and the University of Cambridge - retaining some of their classical elements - with the local landscape to establish the Collegiate Gothic style. The present core campus covers over 269 acres (~1 km²) in a contiguous area of western Philadelphia's University City district. All of Penn's schools and most of its research institutes are located on this campus. Recent improvements to the surrounding neighborhood includes the opening of several restaurants, a large upscale grocery store, and a movie theater on the western edge of campus. Penn also acquired approximately 35 acres of land located between the campus and the Schuylkill River (the former site of the Philadelphia Civic Center and a nearby 24-acre site owned by the United States Postal Service), to be redeveloped for expanded educational, research, biomedical, and mixed-use facilities. In addition to its properties in West Philadelphia, the University owns the 92 acre Morris Arboretum in Chestnut Hill in northwestern Philadelphia, the official arboretum of the state of Pennsylvania. Penn also owns the 687 acre New Bolton Center, the research and large-animal health care center of its Veterinary School. New Bolton Center received nationwide media attention when Kentucky Derby winner Barbaro underwent surgery at its Widener Hospital for multiple fractures to his right hind leg, suffered while running in the Preakness Stakes on May 20, 2006. 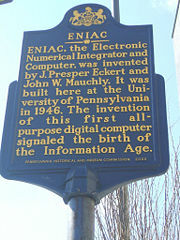 It is located near Kennett Square, Pennsylvania. Penn borders Drexel University and is near the University of the Sciences in Philadelphia (USP). Also nearby is the University City High School. Penn's library began in 1750 with a donation of books from cartographer Louis Evans. Twelve years later, then-provost William Smith sailed to England to raise additional funds to increase the collection size. More than 250 years later, it has grown into a system of 15 libraries (13 are on the contiguous campus) with 400 FTE employees and a total operating budget of more than $48 million. The library system holds 5.7 million book and serial volumes. It subscribes to 44,000 print serials and e-journals. The University Museum, as it is commonly called, was founded in 1887. During the early twentieth century UPM conducted some of the first and most important archaeological and anthropological expeditions to Egypt, Mesopotamia, Africa, East Asia and South America, thus the collection includes a very large number of antiquities from ancient Egypt and the Middle East. Its most famous object is the goat rearing into the branches of a rosette-leafed plant, from the royal tombs of Ur. The Museum also has a strong collection of Chinese artifacts. Features of its Beaux-Arts building include a dramatic rotunda and gardens that include Egyptian papyrus. UPM's scientific division, MASCA, focuses on the application of modern scientific techniques to aid the interpretation of archaeological contexts. The Institute of Contemporary Art based on Penn's campus, showcases various exhibitions of art throughout the year. The College of Arts & Sciences is the undergraduate division of the School of Arts and Sciences, which also contains the Graduate Division and the College of General Studies. Penn has a strong focus on interdisciplinary learning and research. It emphasizes joint degree programs, unique majors and academic flexibility. Penn's One University policy allows undergraduates access to courses at all of Penn's undergraduate and graduate schools, excepting the medical and dental schools. In the humanities and arts, the departments of African American literature, anthropology, art history, biology, communications, demography, English, economics, French, history, political science, psychology, sociology, and Spanish are also extremely well regarded. Particular strengths include business, nursing, engineering, and nanotechnology. Undergraduate students at Penn may also take courses at area colleges participating in the Quaker consortium, including Swarthmore, Haverford, and Bryn Mawr. Penn's graduate schools are among the most distinguished schools in their respective fields. Historically, Penn's graduate level programs have ranked higher in their respective academic fields than the overall undergraduate program relative to other colleges. Significant investments in Penn's faculty, in marketing the institution to new students and more aggressive sourcing of research and endowment funds have allowed Penn to maintain the standing of its graduate schools even as the university focused intensively on advancing its undergraduate programs. Among its professional schools, the schools of business (Wharton School), architecture and urban planning (School of Design), communications (Annenberg School for Communication), medicine (School of Medicine), dentistry, nursing and veterinary medicine rank in the top five nationally (see U.S. News, National Research Council, Planetizen, DesignIntelligence magazines). Penn's law school is ranked sixth and the social work and education schools are ranked in the top twelve (U.S. News). Dual Degree programs which lead to the same multiple degrees without participation in the specific above programs are also available. Unlike joint-degree programs, "dual degree" students fulfill requirements of both programs independently without involvement of another program. Specialized Dual Degree programs include Liberal Studies and Technology as well as a Computer and Cognitive Science Program. Both programs award a degree from the College of Arts and Science and a degree from the School of Engineering and Applied Sciences. For graduate programs, there are many formalized joint degree graduate programs such as a joint J.D./MBA. 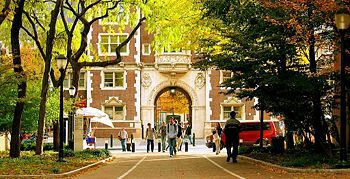 Penn is also the home to interdisciplinary institutions such as the Institute for Medicine and Engineering, the Joseph H. Lauder Institute for Management and International Studies, the Institute for Research in Cognitive Science, and the Executive Master's in Technology Management Program. Penn's health-related programs - including the Schools of Medicine, Dental Medicine, Nursing and Veterinary Medicine, and programs in bioengineering (School of Engineering) and health management (the Wharton School) - are among the university's strongest academic components. The combination of intellectual breadth, research funding (each of the health sciences schools ranks in the top 5 in annual NIH funding), clinical resources and overall scale ranks Penn with only a small handful of peer universities in the U.S. The size of Penn's biomedical research organization, however, adds a very capital intensive component to the university's operations, and introduces revenue instability due to changing government regulations, reduced Federal funding for research, and Medicaid/Medicare program changes. This is a primary reason highlighted in bond rating agencies' views on Penn's overall financial rating, which ranks one notch below its academic peers. Penn has worked to address these issues by pooling its schools (as well as several hospitals and clinical practices) into the University of Pennsylvania Health System, thereby pooling resources for greater efficiencies and research impact. The Castle on 36th and Locust. 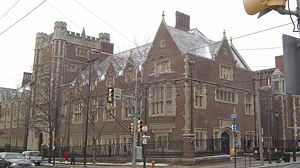 The Philomathean Society of the University of Pennsylvania, founded in 1813, is the oldest continually-existing student group in the United States. The Daily Pennsylvanian has been published since 1885, and is among the top college papers in the country, regularly winning Pacemaker and CSPA Gold Circle awards. The Pennsylvania Punch Bowl is one of the nation's oldest humor magazines. The student-run TV station UTV13 is the oldest college TV station in the country. The University of Pennsylvania Glee Club is one of the oldest continually-operating collegiate choruses in the United States, having been founded in 1862. The Mask and Wig Club is the oldest all-male musical comedy troupe in the country. The University's Political Science Department is known for publishing a semesterly scholarly journal of undergraduate research called "Sound Politicks." The journal is student-run and is widely noted for the originality and quality of the articles it publishes. It accepts submissions from Penn students year round. There are many such journals across the university. The University of Pennsylvania Band has been a fixture of student life on campus since 1897. The Penn Band performs at football and basketball games as well as University functions throughout the year and has a current membership of approximately 80 students. The first athletic team at Penn was its cricket team. In the sport of football, "Penn first fielded a team against Princeton at the Germantown Cricket Club in Philadelphia on November 11, 1876. Penn's sports teams are called the Quakers. They participate in the Ivy League and Division I (Division I FCS for football) in the NCAA. In recent decades they often have been league champions in football (12 times from 1982 to 2003) and basketball (22 times from 1970 to 2006). Penn football made many contributions to the sport in its early days. During the 1890s Penn's famed coach George Woodruff introduced the quarternick kick, a forerunner of the forward pass, as well as the place-kick from scrimmage and the delayed pass. In 1894, 1895, 1897 and 1904 Penn was generally regarded the national champion of collegiate football. The achievements of two of Penn's outstanding players from that era—John Heisman and John Outland—are remembered each year with the presentation of the Heisman Trophy to the most outstanding college football player of the year and the Outland Trophy to the most outstanding college football interior lineman of the year. Penn basketball is steeped in tradition. Penn made its only (and the Ivy League's second) Final Four appearance in 1979, where the Quakers lost to the Magic Johnson-led Michigan State Spartans in Salt Lake City. (Dartmouth twice finished second in the tournament in the 1940s, but that was before the beginning of formal League play). Penn is also is one of the teams in the Big Five, along with La Salle, Saint Joseph's, Temple and Villanova. Penn's home court, the Palestra, is an arena used for Big Five contests as well as high-school sporting events. The Palestra has hosted more NCAA Tournament basketball games than any other facility. Franklin Field, where the Quakers play football, hosts the annual collegiate track and field event "the Penn Relays," and once was the home field of the National Football League's Philadelphia Eagles. It was also the site of the early Army-Navy football games. Franklin Field, the oldest stadium still operating for football games, was also the home to the first commercially-televised football game, and was also the first stadium to sport two tiers. n 2004, Penn Men's Rugby won the EPRU championship. In 2007, the Men's Basketball team won their third consecutive Ivy League title, then lost in the first round of the NCAA Tournament to Texas A&M. Some noted University of Pennsylvania alumni include the ninth President of the United States, William Henry Harrison, real estate mogul Donald Trump, CEO and investor Warren Buffett,(attended for a year before transferring to the University of Nebraska), Cisco Systems co-founder Len Bosack, linguist and activist Noam Chomsky, American industrialist Jon Huntsman, philanthropist Walter Annenberg, E. Digby Baltzell who is credited with the popularization of the acronym WASP, U.S. Supreme Court Justice William J. Brennan, Drew Gilpin Faust, president of Harvard University, and numerous other past and present U.S. Ambassadors, members of congress, governors, cabinet members, and corporate leaders. ↑ The University officially uses 1740 as its founding date and has since 1899. The ideas and intellectual inspiration for the academic institution stem from 1749, with a pamphlet published by Benjamin Franklin. When Franklin's institution was established, it inhabited a schoolhouse built in 1740 for another school, which never came to practical fruition. Penn archivist Mark Frazier Lloyd (Retrieved December 29, 2007.) notes: “In 1899, Penn’s Trustees adopted a resolution that established 1740 as the founding date, but good cases may be made for 1749, when Franklin first convened the Trustees, or 1751, when the first classes were taught, or 1755, when Penn obtained its collegiate charter." Princeton's library presents another, carefully nuanced view. Retrieved December 29, 2007. ↑ A Brief History of the University of Pennsylvania. UPenn. Retrieved October 11, 2007. ↑ Office of the President Upenn. Retrieved December 30, 2007. ↑ Edward Potts Cheyney. History of the University of Pennsylvania 1740–1940. (University of Pennsylvania Press, Philadelphia. 1940), 46–48. ↑ Penn in the 1700s UPenn. Retrieved October 11, 2007. ↑ John Kieran, "Sports of the Times," The New York Times, Oct. 8, 1932, 22. ↑ Dan Rottenberg. Fight On, Pennsylvania. (University of Pennsylvania Press, 1985), 25. ↑ Ohio History Central Online Encyclopedia William Henry Harrison: "At his father’s insistence, [he] studied medicine from 1790 to 1791 at the University of Pennsylvania in Philadelphia. Upon his father’s death in 1791, Harrison immediately joined the United States Army." Retrieved October 11, 2007. Rottenburg, Dan. Fight on, Pennsylvania: A century of red and blue football. Philadelphia, PA: University of Pennsylvania Press, 1985. 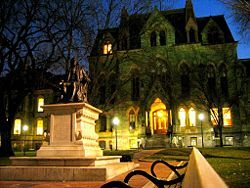 History of "University of Pennsylvania"
This page was last modified on 11 January 2016, at 16:43.